Rev. Dr. Karanos joined the faculties of Hellenic College Holy Cross in 2007. He is currently Assistant Professor of Byzantine Liturgical Music, director of the Holy Cross Certificate in Byzantine Music program, artistic director of the Boston Byzantine Music Festival, and director of the St. John of Damascus School of Byzantine Music of the Greek Orthodox Metropolis of Boston. He studied Byzantine music under Photios Ketsetzis, Archon Protopsaltis of the Greek Orthodox Archdiocese of America. He has a BA in Government from Harvard University, an MBA from Boston University, and a PhD in Musicology from the University of Athens, Greece, where he completed his doctoral dissertation titled “The Kalophonic Heirmologion” under the guidance of renowned musicologist Gregorios Stathis. 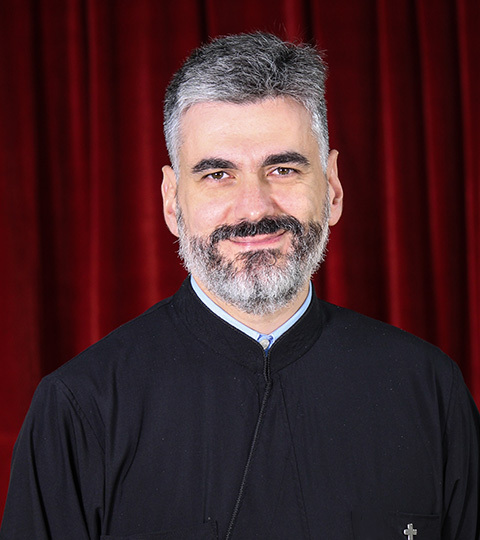 Since 1998, he has served as protopsaltis (chief cantor) of churches in the greater Boston area and is currently Protopsaltis of the Holy Cross Chapel and director of the Holy Cross St. Romanos the Melodist Byzantine Choir. He has lectured and performed as a soloist or member of various ensembles, including the Archdiocesan Byzantine Choir, the Psaltikon Ensemble, and the Byzantine Choir of the Greek Orthodox Metropolis of Pittsburgh, in universities, concert halls, churches, and other venues throughout the United States and Europe. His primary research interests include the morphology and evolution of Byzantine and post-Byzantine chant, the history and exegesis of neumatic notational systems, the dissemination of the psaltic tradition outside the Greek-speaking world, and the relationship between religious and secular musical traditions in the Balkans. 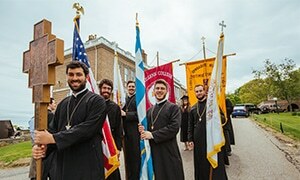 At Hellenic College Holy Cross, Rev. Dr. Karanos teaches Byzantine chant, history of music, and liturgical service rubrics.